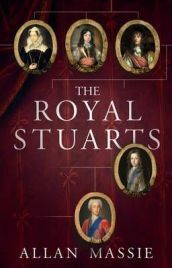 The Royal Stuarts: A History of the Family That Shaped Britain by Allan Massie chronicles the Stuart (or Stewart) monarchs who ruled in Scotland for 300 years, and a further century in the United Kingdom following the Union of the Crowns. The most famous of these monarchs and their descendants are Mary, Queen of Scots, James VI & I, and Bonnie Prince Charlie, but The Royal Stuarts takes us right back to the beginning, tracing their origins from the salt marshes of Brittany to their rise in the nobility of Scotland, leading to their ascendancy to the throne. The daughter of Robert the Bruce, Marjorie Bruce married Walter, High Steward of Scotland. Their son became the first Stewart monarch, King Robert II in 1371. Allan Massie is the author of many novels, and also several works of non-fiction on a variety of Scottish and other topics. The Royal Stuarts was published in 2010. Following our introduction to the origins of the Stewarts, chapters are structured chronologically by monarch. Records are patchy from the fourteenth and fifteenth centuries, so for the first few chapters there is a somewhat superficial feeling of what is covered – the portraits painted of these monarchs are not very detailed, and only scrape the surface. Massie has clearly done his research, but if information isn’t available, there is not a lot to be done about it. As a result, I don’t feel I know a great deal about the two Roberts, and the first few James’. Scotland at the time was difficult to govern, and the crown was a figure of authority but not always one which was regarded as absolute. The details pick up once we get further along in time, and the chapters on the various James’ are very interesting. Massie tells the stories almost in a novel-style, making The Royal Stuarts very readable and easy to follow, while still being informative. Of course, reading a book like this which covers a number of historical figures is like listening to a CD from which you know a couple of hit singles – you find you are quite keen to get to your favourites. From Robert II to James IV, I was learning a lot, but with James V I started to find I was reading what I already knew. This became even more apparent with Mary, Queen of Scots. It is noticeable with these later monarchs that more records are available, simply because the chapters covering them are longer. The chapter on Mary, Queen of Scots was interesting. Quite often, writers make their opinion of her clear in their work, whether they love or loathe her. One thing is certain, her appeal and fascination has lasted through the centuries. Massie, however, takes a rather more realistic approach. He certainly praises Mary and emphasises her charms, both during her lifetime and beyond, but he also recognizes her faults and the reason she had the turbulent reign she did. Incidentally, it was Mary who changed the spelling of Stewart to Stuart in order to ensure French speakers got the Scots pronunciation correct. James VI & I was actually one of the main reasons I wanted to read The Royal Stuarts. I was keen to learn more about Mary’s son, the man who united the crowns of England and Scotland in 1603 on the death of England’s Elizabeth I. Massie provides another in-depth section on this monarch, although obviously only as in-depth as he can be in this book covering so much time, yet I feel I want to know more about James I & VI. A positive point to raise at this point however is that Massie continually refers to the monarchs who ruled after the Union of the Crowns by their proper titles – James VI & I, James VII & II and so on, acknowledging that while the monarch may be the first or second of that name to rule the United Kingdom, they are not the first for Scotland (hence we come to the argument that our current monarch should in fact be Elizabeth I of Great Britain, but that’s a debate for another day…). As we come towards the end of the book, Massie begins to cover the Jacobites. King James VII & II was deposed and forced into exile in favour of his daughter Mary and her husband William of Orange. Many still supported James as the lawful king however, and his supporters were known as the Jacobites. Following his death, his claim passed to his descendants, his son James Francis Edward Stuart, who was proclaimed as King James VIII & III by his supporters, and formally recognized as king by the Pope and Louis XIV of France. Known as the Old Pretender, his son Charles Edward Stuart, better known as Bonnie Prince Charlie, became known at the Young Pretender. The Jacobites were involved in various uprisings and rebellions, the most prominent being the Fifteen (1715) and the Forty Five (1745), and the clans suffered terrible reprisals such as the Massacre of Glencoe, but never managed to achieve their goal. I found this a particularly interesting section of The Royal Stuarts. Despite studying the Jacobites at school and having visited Culloden, where the last pitched battle to take place on British soil was fought in 1746, I feel this is an important period of Scottish history of which I know woefully little. Massie is only able to give a general overview of events through this time, but it was enough to waken my memories of history class, and kindle a desire to learn more. While The Royal Stuarts, containing as it does several hundred years of history into one book, can only ever provide an overview of the trials and tribulations of the Stuarts, it is a very good introduction not only to the House of Stuart, but also to very important events in Scottish and British history – the Union of the Crowns, the Civil War, the Acts of Union and the Jacobite uprisings are all covered within The Royal Stuarts. No Comments on "The Royal Stuarts: A History of the Family That Shaped Britain"